‘War on terror’ was a flawed term from the start. But Asian governments, too, are willing to play politics with terrorism. Of course this is nonsense—in old-fashioned military parlance, a terrorist is simply someone who strikes at soft targets in a way designed to terrify a civilian population as a means of trying to shape the agenda. Buses and trains, airplanes, crowded bars and tourist destinations are always popular for this type of warfare—it’s simply one bloody means for obtaining an end and can be deployed equally by governments, militaries, separatists and insurgents of all types, including religious fundamentalists. But because of the political interference that too often accompanies the handiwork of terrorists, there’s no international legal agreement or criminal law that properly defines terrorism, which is ultimately the cheapest, easiest and most common strategic tactic employed and enjoyed by bullies the world over. This is why the declaration of a ‘war on terror’ by former US President George W. Bush seemed such a silly response to the tragic events that unfolded on September 11. Instead of declaring war on the combatants—al-Qaeda and their Islamic militant affiliates—he took much of the Western world into battle against a type of warfare. This is akin to the Kennedy administration declaring war against guerrilla tactics deployed by the communists rather than the Viet Cong itself during the Vietnam War, or a declaration of war by Franklin Roosevelt on sneak attacks rather than the Japanese in the aftermath of Pearl Harbor. Such distinctions are too often lost in the carnage, but the reality is that a ‘war on terror’ makes no more sense now than it did then, when it allowed members of the Bush administration to carry on their Middle East business dealings with unsavoury middlemen whose connections with al-Qaeda—whether direct or indirect—have been well documented. Unfortunately, the precedent of muddying definitions of this sort for political benefit that was set by the Bush administration didn’t end with the Bush presidency. Indeed it’s a precedent that now appears to be being followed with some gusto in South-east Asia. Recent investigations into a bus bombing that left 10 dead in the Southern Philippines—widely regarded as the ‘second front’ in counterterrorism efforts—have given political opportunists in the Philippines the chance to latch on to a terrorist incident for their own gain. Hundreds of thousands have been displaced by conflict in the southern Philippines. Those left in resettlement camps say they are being forgotten. 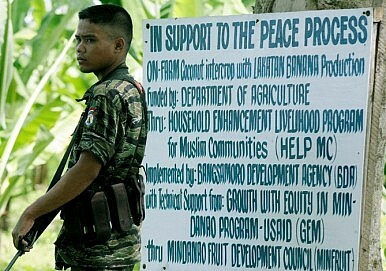 Philippines Ceasefire Under ThreatViolence Looms over Upcoming Poll Mindanao’s Insurgencies Take an Explosive TurnIs Abu Sayyaf Really Defeated?Can Duterte Bring Peace to the Philippines?